This page has extra material associated with the original edition of the book. The Color Companion is a PDF file containing images from the book, in color and high resolution, with brief commentary. It includes the new PHD Food Plate, and the Errata and Index. We encourage everyone who owns the book or is considering buying it to download this free PDF. 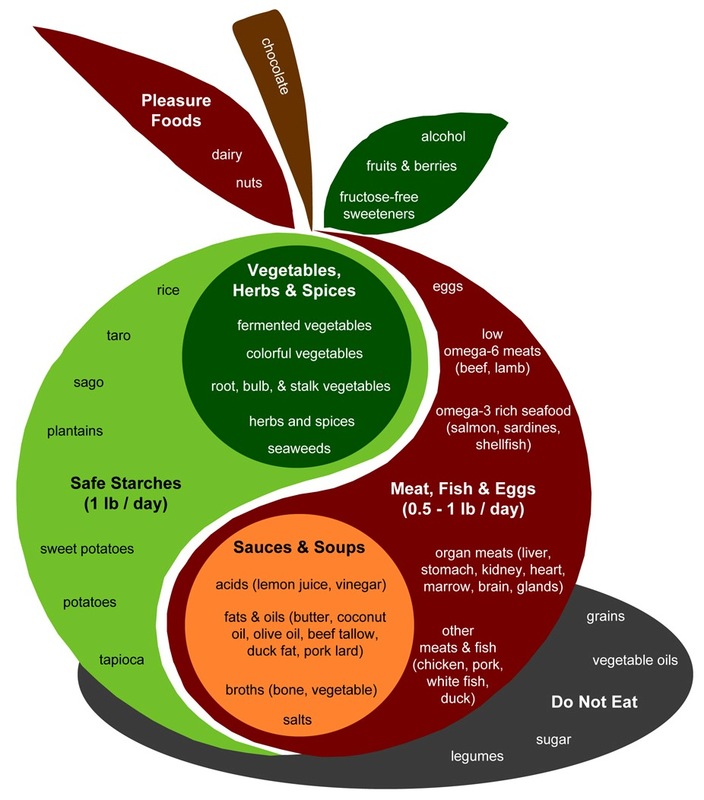 Click to open in the browser, or right-click and “Save Target As” to download: Perfect Health Diet Color Companion. This is an online index to our book. Please feel free to suggest additional keywords in the comments. These are corrections or clarifications to the text of the book. Deletions or additions are in italic bold. Most carbs are a fat source. The average American gets 55% of calories from carbs, but most of these are converted to fat. On high-carb diets, fructose is converted directly to fat in the liver (if all goes well), and beyond 15-20% of calories glucose is either converted to fat and stored in fat cells, or substitutes for fat as an energy source. Thus, that 55% of calories that enters the mouth as carbs may later end up in the body mostly as the 16-chain saturated fat palmitic acid. Most people don’t know that most of the carbs they eat become fat in the body. If they did, they might not be so shy about eating the fat directly. Excess carbs are a fat source. The average American gets 55% of calories from carbs, but will probably not utilize more than about 30% of energy as glucose. On high-carb diets, fructose is converted directly to fat in the liver (if all goes well), and excess glucose is either converted to fat or substitutes for fat as an energy source. Thus, a significant fraction of that 55% of calories that enters the mouth as carbs may end up in the body as fat. Most people don’t know that many of the carbs they eat become fat in the body. If they did, they might not be so shy about eating the fat directly. p 45 the impaired immune function and other risks of glycogen deprivation. the impaired immune function and other risks of glucose deprivation. p 76 the chemically fragile PUFA, whose extra carbon double bonds are easily altered by oxidation, glycation, or fructation, are frequently modified into toxic compounds in the body. the chemically fragile PUFA, whose extra carbon double bonds are easily altered by oxidation, are frequently modified into toxic compounds in the body. p 96 Although gut bacteria generate healthful short-chain fats, they also generate harmful “endotoxins” – toxic bacterial proteins that excite an immune response…. Endotoxins are fat-soluble proteins and they are carried into the body with dietary fats. Although gut bacteria generate healthful short-chain fats, they also generate “endotoxins” – lipopolysaccharides that excite an immune response…. Endotoxins are fat-soluble and are carried into the body with dietary fats. p 104 Rice has about 1300 calories per pound: thus, a quarter pound (100 g), or about 3/4 cup (180 ml) of cooked rice, will provide the daily 300-400 calories. Uncooked rice has about 1300 to 1700 calories per pound, but rice absorbs a lot of water during cooking and cooked rice typically has only 500 to 600 calories per pound. Thus, a cup (180 ml/160 g) of cooked rice will provide about 200 carb calories, and several cups of cooked rice may be eaten per day. p 191 Most people get some MK-7 from gut bacteria and some MK-4 from foods like liver, butter, cream, cheese, and eggs. Most people get some MK-7 from gut bacterial fermentation of fiber and fermented foods like cheese, kimchi, and natto, and MK-4 from animal foods such as liver, butter, cream, and eggs. p 207 recommended daily allowance is only 0.9 gm/day. recommended daily allowance is only 0.9 mg/day. p 243 Bacterial infections of the brain often cause depression, and drugs which relieve the depression by increasing serotonin levels may backfire by providing bacteria with tryptophan. For this reason, bacterial infections of the brain often cause depression. p 252 Cancer cells are metabolically impaired and can only metabolize glucose, a phenomenon known as the Warburg Effect. Cancer cells are metabolically impaired and can only metabolize glucose and some amino acids such as glutamine. p 259 fructose avoidance is needed to prevent toxic “fructation” of omega-6. fructose avoidance is needed to prevent toxic “fructation” of proteins and subsequent peroxidation of omega-6. Hi Paul. Do you have the reference(s) you used for the “fructation” changes you made in the first and last errata? Thanks. It was just a slip of the mind in the early edition … proteins are fructated, not fats; fats are oxidized; fructated/glycated proteins promote oxidation. There are Pubmed references for protein fructation/fructosylation of proteins but none for fat fructation. The following are not errata but rather format suggestions that are inspired by the creative format features already incorporated in PHD. Put the Table of Contents on facing pages so it can all be viewed/scanned without any page-flipping. Put page numerals in the Table of Contents on the left of their respective lines rather than far away on the right. Displace the entire content of the right-hand page (as an intact block) as far to the right as its longest line allows. Put the numerals identifying pages in the book (“page numbers”) in the upper, outer corners of the pages; make them fairly large and black. Use the page headers for Section (on the left) and Chapter (on the right). Drop the decorative little line drawings from the page headers. When we do a second edition, we’ll solicit reader feedback on design and layout. So we’ll see if readers like these ideas. OK, I’ll hold further thoughts about layout/etc until you put out the call for them. I do want to say I absolutely love the way you handle citations — right on the page where they are cited, and if something is cited more than once, you provide a separate citation each time, so no time is wasted searching back for it. Excellent! Here’s an actual erratum (I think). On p45, a sentence ends “and other risks of glycogen deprivation”. I think you meant “glucose deprivation”. Sorry to put something in an inappropriate place. I’m new to your remarkably well-developed site, and I haven’t found the right place to ask questions arising from your book and my efforts to implement it in my eating. One example: I use natto, Japanese fermented soybeans, as a source of K2. Soy is a legume (bad), but fermented (good?). So I’m wondering whether the net effect of including natto is good, bad, neutral, or unknown. Where should I put things like this? You can put questions anywhere and I’ll answer them … questions related to vitamins might go best on the supplement recommendations page, questions about the diet maybe on the diet page. Fermenting does partially detoxify the soybeans, and the K2 is good. We eat a bit of fermented soy in soy sauce, but I’d be cautious about eating large amounts of natto. It’s unknown whether the net effects are good or bad … for me it was an easy choice because I dislike the taste of natto and am happy to supplement K2. I prefer to keep all my foods toxin-free and supplement if I’m concerned about nutrition. And thanks for the editorial thoughts! Thanks, I caught the 2nd one myself the other day but haven’t posted it yet – should be 100 g/day. I’ll look up the first one. On p45, a sentence ends “and other risks of glycogen deprivation”. I think you meant “glucose deprivation”. Was “glycogen deprivation” really what you meant? Have you considered a downloadable index? It would be most helpful. Yes, I want to put an index online, I can make it downloadable too. 1. What alternative sweeteners do your recommend for sugar? Some believe raw local honey, in the past barley malt syrup was recommended since it breaks down as a complex crab. What is your feeling? 2. There must be some beans that are fine to eat can you please elaborate on this. are the sprouted grain breads without flour safe? 4. Which fruits do you consider unsafe due to sugar ratio to fiber? Felt your book was informative but too much repletion of the same material. Would prefer more information regarding actual foods. Also, terms need to be defined before you subject readers to information using these undefined terms. After all you are selling to the general public. Perhaps a glossary of terms would be the easiest way to go about this addition. 1. The supplement recommendations page, http://perfecthealthdiet.com/?page_id=1066, lists some sweeteners we recommend. Rice syrup is our favorite calorie-containing sweetener, and sugar alcohols like erithrytol or xylitol our favorite calorie-free sweeteners. Other safe starch sweeteners or calorie-free ones like stevia are good too. 2. For legumes we would eat the low-calorie, low protein ones. Peas and green beans are healthy. As they go up in calories and protein, they become more dangerous. Soaking overnight, sprouting and fermenting can partially detoxify them. I would not trust any commercial, industrially produced bean products. We personally do not eat beans at all, but if you would like to, look for low-calorie and low-protein species and cook them thoroughly. 3. I don’t believe sprouted grain is good. It’s better than grain that hasn’t been sprouted, but still bad. 4. For fruits, we have a table in our book. Generally speaking, berries and low-fructose fruits like bananas and plums are best. High-fructose fruits like the commercial breeds of apples and pears are worst. Thanks for your advice about the book, we’ll keep that in mind in future editions! I just received the book and looked through it. I am hopeful that your plan will be really helpful to me. I have been on a Nourishing Traditions (by Sally Fallon) type diet for about a decade and low-carb for a year and a half. But I have been floundering with respect to some specifics. I am looking forward to reading the book carefully. Anyway, I already have a question. Why do you recommend white rice over soaked and/or sprouted brown rice as recommended in Nourishing Traditions? Fallon claims that soaking and/or sprouting neutralizes the phytates in the rice bran. Thanks in advance for your help, and thanks for doing such a thorough job of spelling out your diet, and the science behind it. Soaked and/or sprouted brown rice is good too, and has a little more nutrition than white rice. We write with an audience of ordinary people in mind, and want to make things easy for busy people who don’t want to take the time for soaking and sprouting. So we suggested white rice, which is nearly non-toxic, rather than brown rice which (unsoaked and unsprouted) is a bit more toxic. One more vote for an index – I love using an index! A recipe section with ingredient/nutrition amounts would be a good addition, too – just gives more ideas to help guide folks with a starting point and ways to hit the macro nutrient ranges. A section like “Making Foods Safe” … soaking/sprouting brown rice, others. Love your style Paul – keep it up! Could you please help clarify these comments from the book? “Sweet potatoes, yams, and potatoes provide 300 calories of glucose per pound, so one pound (454 g) will provide our daily target of safe starches. Everyday US sweet potatoes (Ipomoea batatas) seem to be almost 100 calories more per pound than yams and potatoes (390 vs. ~300). “split evenly” … as in 1/4 lb rice (150 cal) + 1/4 lb (100 cal) sweet potato? Yes, you have it right … we did make one mistake, though, overestimating the calorie content of cooked rice. So 1/2 pound cooked rice or 1/2 pound taro would both have about 300 calories … or 1 pound potato or sweet potato … of course to get the numbers exactly right you should look the food up at nutritiondata.com or a similar site, as you’ve done. So, the “About a half pound of safe starches” statement really just applies to taro and rice and not sweet potatoes and potatoes (which would be 1 pound instead)? I’ve read your book and found it quite convincing. Further I enjoy your blog and recipes. Since your book cites lots of medical research, I am wondering how Ioannidis’ study influenced your research and the studies you relied on to support the theories in your book. Ioannidis’s work is interesting and not surprising. First, there is only one truth, but many ways to err. Second, there are a lot of people in the biomedical field focused on career advancement more than discovery of truth, and careers are advanced by publishing papers whether they’re right or wrong. So odds favor a lot of error popping up. But Ioannidis may overplay his hand a bit. I’ve found Pubmed papers to be right more often than not. When they’re wrong, there’s often a contrary paper. So while I wouldn’t trust individual findings just because they’re published, I think it’s possible to synthesize a good view of the truth out of the literature as a whole. Is your book available in Chinese? Also, have you had any luck “curing” acne with the Perfecthealthdiet? No, sorry, no translations available yet. I haven’t heard any reports from people with acne yet. I might do a blog post on acne, but it won’t be based on a demonstrated cure. I’ll also do a rosacea series. Cordain’s advice has been to avoid saturated fat and simply eat all the lean meats, fruits & vege’s you can eat. So I had been eating as much as 10 servings of fruit a day, sometimes more, and less vege’s because well fruit tastes better. And I had been supplementing with Carlson’s liquid fish oil, typically twice a day. When I came across your site recently and started reading your advice on fish oil, fructose consumption, and limiting meat intake I adjusted my diet and have seen immediate positive results. I increased my sat fat intake, mainly from coconut oil which I had actually tried cutting out earlier this year (due to Cordain’s advice) and I’ve started limiting my meat to about 1lb a day, and I’ve started limiting my fruit to 2 or 3 servings a day while increasing vege intake, especially from green leafy vege’s, while increasing my carb intake a little by eating some white rice for the first time in years. All of those changes I think are good, but I believe that in particular the increase in sat fat intake has been clearing up my acne because I was already experimenting with sat fat intake before finding your site and buying your book a few weeks ago and I was noticing immediate improvement on the days that I cooked my food with coconut oil compared to the days that I was limiting sat fat intake. It was just last month that I was waking up every single morning to find new acne forming on my face but the day that I started spooning coconut oil is the day that stopped. Of course like I said it has only been 2-3 weeks now so I can’t claim to have actually cured my acne yet, but I’m going to continue following the perfect health diet closely and in a few months I’ll have a more accurate confirmation. Hopefully a positive one. I’ve even reintroduced some dairy back into my diet recently, per your advice and mostly from raw milk cheese yet still in relatively small amounts. BTW, I had already been experimenting with intermittent fasting for the past year and I noticed that when I fasted my face would definitely break out the next day. Since discovering your advice on eating green leafy vege’s, berries, and plenty of coconut oil during a fast I have followed a 16/8 eating cycle for the past 8 days straight without any skin problems at all. I also just feel “better” during the fast while previously, I thought that a fast wasn’t a fast unless I consumed nothing but water and black coffee. Your advice both in your book and on this website has been invaluable to me. Thank you! Thanks, Hunter. That’s great news! One thing I should have said to Ryan is that I suspect a fungal/Candida connection to chronic acne. These are all things you’ve recently implemented. Maybe not a coincidence! Do you have any idea when you’ll be publishing a 2nd edition? Most likely 2013. Why not get the current edition and read the errata page? Yet endotoxin is the lipid A moiety of Gram-negative lipopolysaccharide (LPS). It is made up of lipids and modified sugars. Thanks, Eric. I’ll have to think about how that should be re-phrased. 2. (pg 48, top) The caption for the LDL diagram states the colours of various features. The diagram is b/w. I will read your book soon as it looks informative. Do you have any advice in the book or on this site for those of us whose blood sugar goes to 200 with just 1/2 cup of rice or potatoes or yams? It would be really helpful if you have the time to make a printable list of abbreviations used in the book. It would make reading easier. We so enjoyed the potluck on Saturday and your presentation! More than that, though, we enjoyed and appreciated your sincerity and the fruits of your diligence. You are both shining examples of what can be when we take our “fate” into our own hands and do everything within our power to help ourselves and others. Thank you! Your potluck was delightful! We had a wonderful time. I’ll email you separately, but we are looking forward to seeing you and your friends again. I recently bought your book and found it very informative. I did have a question, though. You mentioned that you only use palm KERNAL oil in your cooking, not palm oil. The oil I’ve been using is organic palm oil (by spectrum). Is there a big difference between the palm oil and palm kernal oil? Also, I’ve had bad reactions to coconut oil in the past ( allergic,perhaps? ), so when I add in more oil to my diet, would it be acceptable to sub high quality olive oil? Would this also work on the fasting days when one would normally be using coconut oil? Palm oil is an excellent oil. The distinction about palm kernel oil is that it is ketogenic, ie it has lots of shorter-chain fats like coconut oil, whereas palm oil has only long-chain fats like butter. Both are good, healthy oils. Yes, olive oil is a healthy oil. Also butter and palm oil are good, and animal fats generally. On fasts you might try skipping oils entirely (a true fast), or trying MCT oil (or palm kernel oil if you can find it). is the table on pg. 117 correct? I have just been re-reading all the O3, O6, related sections. Now it looks (to me) like the text is saying re. optimal ratios; that O6 LA is 28% & O3 (epa+dpa+dha) is 72% (O6:O3 ratio 1:2.57). LA intake=4.8g/day & EPA+DPA+DHA=1.8g/day from 1.2lb salmon per week (ie. O6=72.7% & O3=27.3%). would you clear up for me pls, thx. The book is correct, but the ratios are a bit tricky. The optimal TISSUE ratios are in terms long-chain highly unsaturated PUFAs — ie not including linoleic or alpha linolenic acid, the 18-carbon omega-6 and omega-3 PUFAs. For this ratio you want 3x more omega-3 than omega-6. The optimal DIETARY ratios include the shorter omega-6 and omega-3 fats, and for these end up being about 3 parts omega-6 to 1 part omega-3. easy to get confused on that one. especially when the ratios/percentages are basically the same, only reversed. I believe that there’s an error in the linoleic acid illustration on page 46. I count 19 carbon atoms rather than 18. The extra atom is in the section between the first and second double bonds. In the text, “The ‘omega-6’ designation means that the first double bond appears 6 carbons from the ‘omega’ carbon…” on the same page, I think that that calling it “the last double bond” may be more accurate. I purchased the book for my Kindle. Unfortunately, the apple shaped representation of what you should and shouldn’t eat is not readable on my Kindle. I looked at your PDF color companion, but it did not seem to be in that document. Is it available as a separate PDF downloadable document? If so, where can I find it? If not, please consider either adding it to the color companion or making it available. Thank you! Love the book -thank you! Well, I suggested lots of possible words for the index but it’s not appearing here. Maybe it’s stuck in a spam folder? It was in the spam folder, I’ve restored it. Thanks! In your book you recommend against fish oil due to the likelihood that it will be rancid. What do you think of krill oil? Its proponents claim that it doesn’t go rancid due to the high amounts of astaxanthin in it. Thanks.